Nesis (1977) described M. psychrophila from Antarctic waters on the basis of four specimens, the largest of which was a nearly mature male of 143 mm ML. without large, lateral pegs on outer rings of club suckers. with large tragus and distinct antitragus on funnel locking-apparatus. Club suckers small (diameter ca. 0.15 mm) (Nesis, 1977). Club suckers circular without large inward directed knobs; outer rings with 12-15 short, blunt-rounded knobs around entire perimeter (Nesis, 1977). Figure. 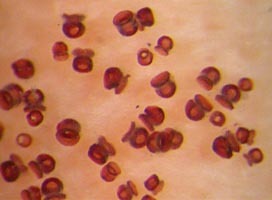 Club suckers of M. psychrophila. Left - Oral view of one sucker, holotype. Drawing from Nesis (1977). Right - Oral view of a portion of the club, holotype. Note the interspersed small suckers which may regeneration stages of previously lost suckers. Photograph by M. Vecchione. Scanning electron micrographs of the suckers can be found here. Beaks. Description of the beaks in 2D can be found here. Description of the beaks in 3D can be found here: Lower beak; upper beak. Funnel locking-apparatus with well developed tragus and distinct antitragus (Nesis, 1977). Figure. Frontal view of the funnel locking-apparatus of M. psychrophila, holotype. Drawing from Nesis (1977). Figure. Funnel/mantle locking-apparatus of M. psychrophila. Left - Frontal view of funnel component, NMNH 817317, 105 mm ML, 57°56'S, 77°04'W, methylene blue stain. Left-center - Funnel component cut along midline and turned back to show longitudinal sections of the lock, 99 mm ML, methylene blue stain. Note the strongly undercut antitragus. Right-center - Frontal view of the mantle component, 99 mm ML. Photographs by R. Young. Right - Frontal view of the funnel component, holotype, 84 mm ML. Photograph by M. Vecchione. Mantle, head, arms and fins (dorsal and ventral surfaces) with small integumental photophores (Nesis, 1977). Closely spaced photophores in the transverse surface on arms IV suggest that more than two series exist. Figure. Aboral view of the proximal region of arm IV, M. psychrophila (? ), 64 mm ML, 39°19'S, 03 °15'W. This small specimen captured near the presumed northern limit for the species probably belongs to M. psychrophila. See the locking apparatus of this specimen on the page: Mastigoteuthis : Comparison on mantle locking-apparatuses. Composite photograph by R. Young. Figure. Aboral view of arm IV photophores of M. psychrophila, holotype, showing closely spaced photophores. Although most photophores are missing, the few remaining indicate a pattern of the type seen in the previous photograph. Photograph by M. Vecchione. 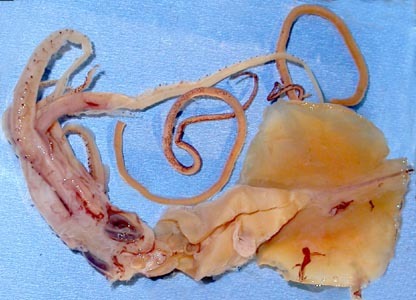 M. psychrophila is very similar to other species of Mastigoteuthis. Its most distinctive features are the shape of the funnel locking-apparatus and the apparent lack of tentacular suckers with pronounced lateral pegs on the outer sucker rings in large specimens. Unfortunately the pattern of photophores on arms IV is not known with certainity but, based on evidence presented above, appears to differ from other members of the genus in having more than two series of photophores. Paralarvae and mature adults unknown. Type locality: 59°26'S, 158°36'E, Antarctic waters south of eastern Australia in an open midwater trawl that fished mostly at 500 m depth at night. 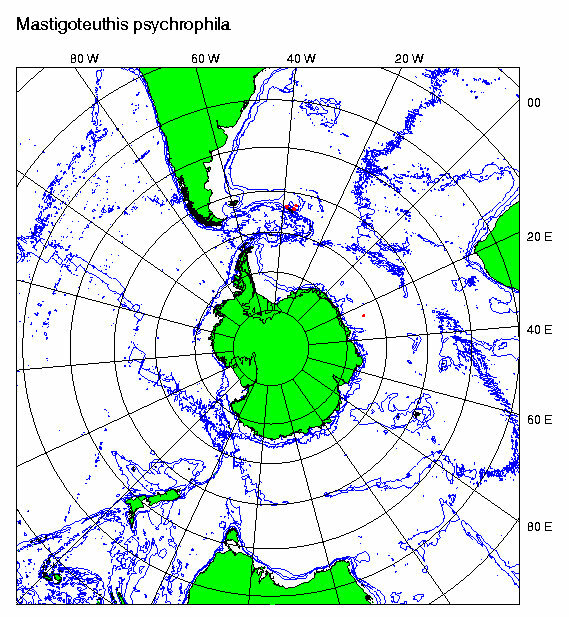 Nesis (1977) also reports a record in the same region at 55°S and in South Atlantic Antarctic waters at 57°S, 26°W. He states that they were taken from water of Antarctic and Subantarctic structure. The NMNH no. 817317 squid came from 58°S, 77°W just into the Pacific Antarctic waters. The NMNH no. 884836 squid came from 62°50'S and 114°30'W. Nesis (1977) considered the distribution to be circumantarctic occurring both north and south of the Antarctic Convergence. If specimens we have examined from approximately 40°S in the Atlantic prove to be M. psychrophila, as we suspect, the Atlantic distribution will extend well north of the Antarctic Convergence to the region of the Subtropical Front. Additional records are found at the British Antarctic Survey. Nesis, K.N. 1977. Mastigoteuthis psychrophila sp. n. (Cephalopoda, Mastigoteuthidae) from the Southern Ocean. Zoologichesky Zhurnal, 65(6):835-842. Page: Tree of Life Mastigoteuthis psychrophila Nesis, 1977. Authored by Richard E. Young and Michael Vecchione. The TEXT of this page is licensed under the Creative Commons Attribution-NonCommercial License - Version 3.0. Note that images and other media featured on this page are each governed by their own license, and they may or may not be available for reuse. Click on an image or a media link to access the media data window, which provides the relevant licensing information. For the general terms and conditions of ToL material reuse and redistribution, please see the Tree of Life Copyright Policies.